MACAU -- Losing back-to-back fights, even if most of the world felt he won one of them, did little to hurt Manny Pacquiao's earning power. Promoter Bob Arum said that Pacquiao is guaranteed $18 million to fight Brandon Rios on Saturday (Sunday Macau time) at Cotai Arena. 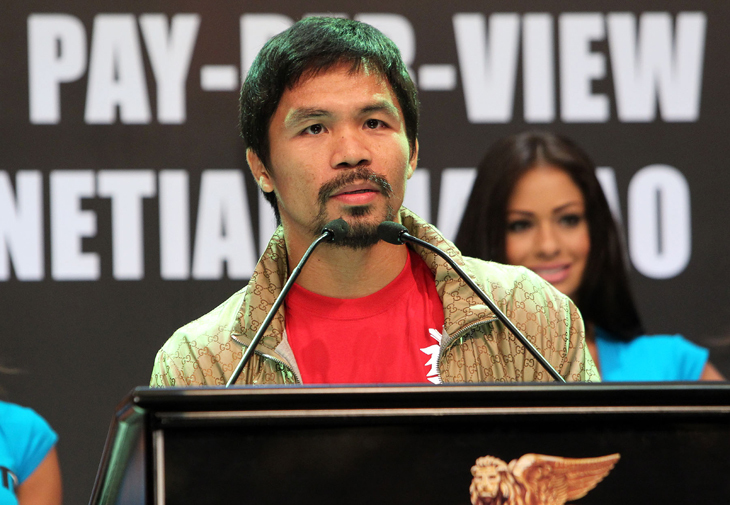 With pay-per-view upside, Pacquiao could make upwards of $30 million. That's not quite the $100 million that Floyd Mayweather walked away with after his win over Canelo Alvarez in September in Las Vegas, but it's nothing to sneeze at and it's made better by the fact that he won't be taxed in Macau. Rios is making a guarantee of $4 million, and Arum said that Rios has little upside. The most surprising purse on the card may belong to flyweight Zou Shiming, who will earn $500,000 in just his third pro bout. Zou, though, is a special case. The two-time Olympic gold medalist is the reason that the Venetian Macao decided to get into boxing. "Without him, none of us would be here," Arum said when a reporter expressed surprise at the amount of Zou's purse.